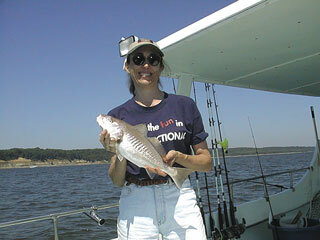 Here's Claire Foster and a great looking rockfish caught June 30 while fishing with the William Whitefield crew. 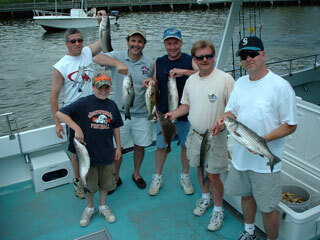 And here's a group from Patuxent Wildlife Research Center with a good bunch of rockfish and croakers, caught June 28. From left to right (foreground), that's Kevin, Danny, and Matt. Behind, that's Pete, Harry, Dennis, Oliver, Chris, Seth, and Peter. 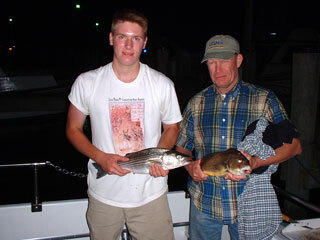 Here's Danny and his dad Dennis with a rockfish and a big croaker. 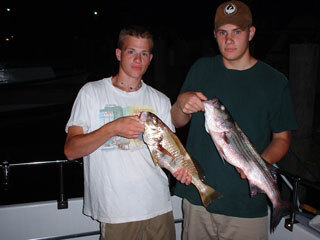 And Oliver and Chris Perry with a croaker and a rockfish. 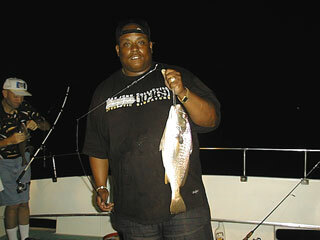 And here's Lamont St. Thomas with a magnificent 20 inch croaker, caught on the evening of June 24. Lamont helped crew chief Mike Kwiatkowski and others catch over 100 croakers and limits of rockfish and a good number of blues. Here we have members and friends of the Frederick Chapter of MSSA, who were fortunate enough to win a day on the Worm in the Chapter's annual raffle. After catching their limits of rockfish, they went on to catch a fine bunch of blues to 3 pounds. 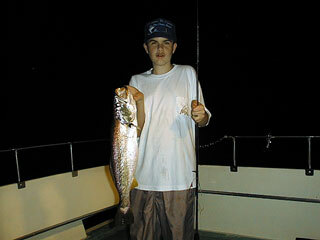 And here we have a member of the Roland Taylor crew from the evening of June 23 with a fine double header of croakers. 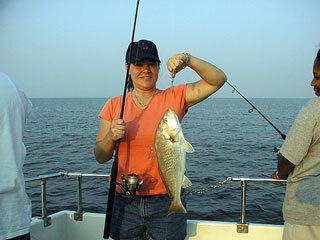 These two were part of a catch of over 200 croakers, shown below. 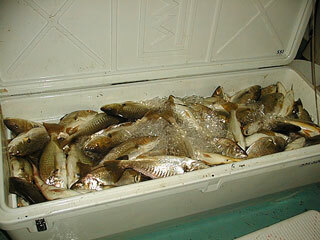 This is what more than 200 croakers looks like. Imagine cleaning that many fish! 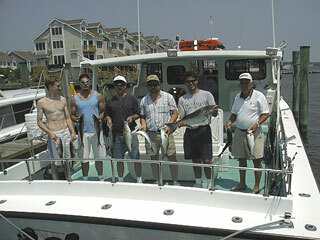 And here we have a crew from Power Solutions with limits of rockfish, caught June 23. 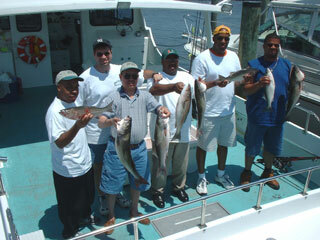 Here we have the Steve Zimmerman crew with their limits of rockfish and a fine catch of bluefish, caught on June 22. Here we have a group from Striker Construction Masonry Contractors on June 20 with their limits of rockfish to 31 inches. Here's Darryl Sebastian of the Striker crew with the fish of the day, a fine 31 inch rocky. 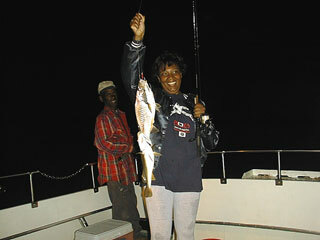 Here's Lonnise Gilley with a fine croaker, caught on June 18. And here we have the Chuck Carpenter crew from June 14 with a nice black drum. 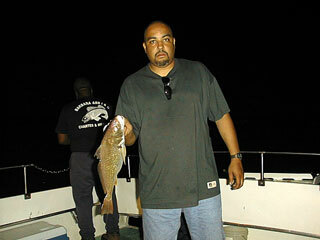 Here's Jeff Wallace on the night of June 13 with a 19 inch croaker. By the end of the evening, they had caught 11 rockfish, 75 croaker, and a couple nice trout. 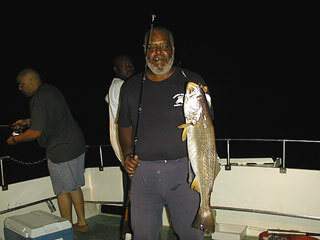 And here's Walter Hackney, who was fishing with Jeff, when he caught this beautiful 29 inch seatrout. And here are part of the crew from Patuxent Wildlife Research Center's evening dinner cruise to Harrison's on Tilghman's Island. 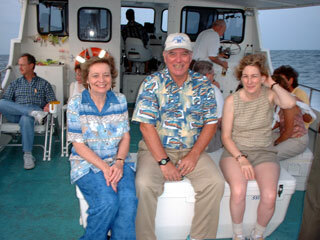 On the cooler, from left to right, that's Linda and Harry Coulombe next to Lois Loges. Click here for more photos. Here we have the Court Treuth crew from the afternoon of June 15, with their limit catches of rockfish and a good bunch of blues. From left to right, that's Mike and son Mikie, young Matthew and dad Court, and son Eric and dad Ray. Here's another big croaker being held by Danielle, part of the Devin Watson crew from the evening of June 11. 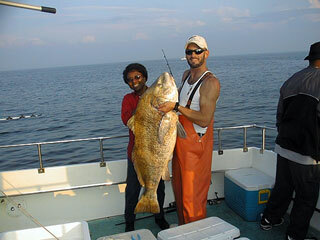 And here's the Greg Pheiffer crew from June 11, with their limits of rockfish. Here we have Michael (left) and Danny Shafer, a couple young crew members who helped Dave McGinnis catch their limits of rockfish and a bunch of evening croakers on June 10. 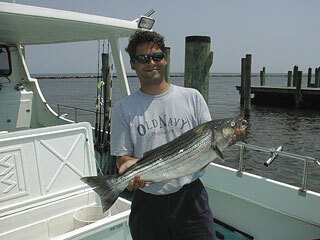 Here's Kevin McGinnis in the middle, showing off a fine striper. 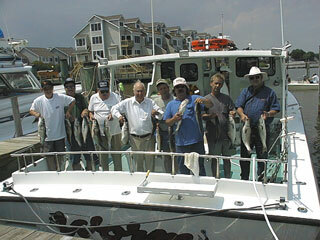 The chumming season is here, but these fine rockfish were all caught while trolling by the Bob Crist crew on June 10. Behind young Jake, from left to right, that's "Big Dog", Mike, Bob, Chuck, and Kevin. Here we have Dave Mock, part of the Pat Mock crew of June 9, with the first large seatrout of our season, an impressive 27" beauty. 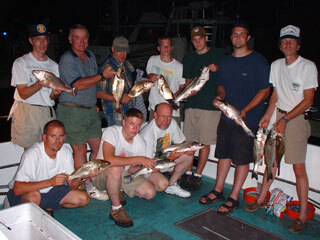 And here's the Ian Kluge crew from June 9, with some of their limit catches of rockfish. From left to right, that's Aaron, Ian, Rico, Gaddy, Ray, and Mark. Good catch guys. Evening croaker fishing continues to be impressive. 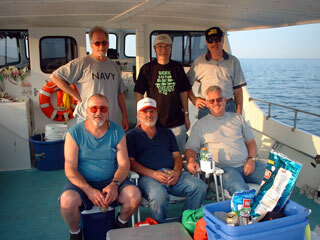 Here is part of the Taylor crew on a recent outing on the Bay. 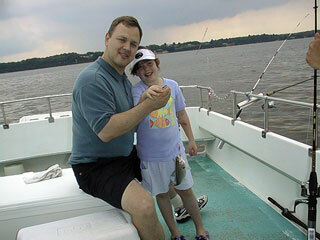 Here we have Bob McDonald and Hannah with a fine croaker, one of many caught on the afternoon of June 8. 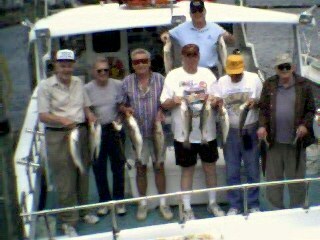 And here's the Dave Reynolds crew from June 8, with their limit catches of rockfish. 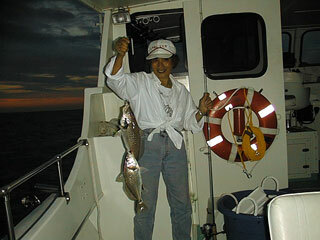 June 7 in the evening, and croaker fishing is red hot! 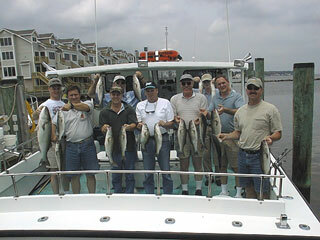 After catching limits of stripers, the Joe Modaffari crew from Pittsburgh had a ball catching these hard fighting fish. From left to right (front), that's Bob, Dave, Hank, (back) Walt, Joe, and Jack. 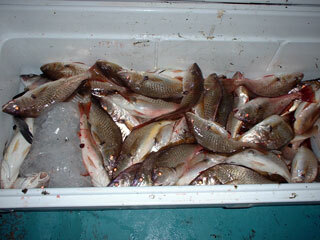 Here are some of the croakers they caught, some of which were nearly 18 inches. And here's the Wayne Dunaway crew with their limits of rockfish, caught June 6 on the Worm. It's June 3 and black drum fishing has been the best we've seen in years. 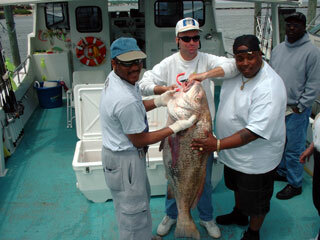 Here we have part of the Mike Kwiatkowski (center) crew with a drum of more than 60 pounds, Mike's largest ever. When a drum this size wants to go back to the bottom, all you can do is hold on. 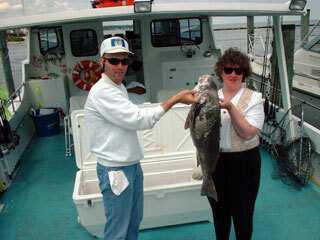 And here's Mike and Kerri with a 20 pounder, her largest, and the first one caught on their trip. Here's Mrs. Hill with another huge black drum, taken on the afternoon of June 2. 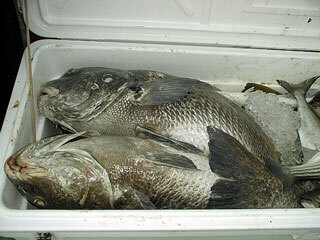 While we haven't had a super huge black drum, we've had about a dozen in the last 4-5 days that went over 60 pounds! 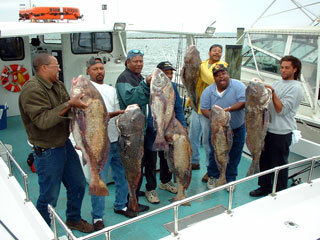 Here we have the Darrell Dixon crew with a limit of black drum, including a boat record 67 pounder. 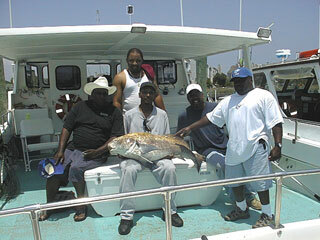 From left to right, that's Carrington Dixon with his 67 pounder, Willie Dixon, Mike Williams, Leon Brown, Darrell Dixon, Matt Coleman, and Sayyid McCluney. For more photos, click here.